Economic assessment is an integral part of environmental decision-making, but coupling economics with biophysical processes is a complex task. Applying an economic lens can assist in evaluating risks, understanding benefits and costs from competing management pathways, assessing public preferences, and developing business cases for addressing environmental problems. It can also aid in communicating decisions using monetary value as a single, easily understood metric. However, limited dialogue between economists, ecologists and decision-makers often leads to questionable or impractical economic outputs. Achieving useful economic assessment in an environmental context requires a unique ability to bridge across disciplines. When this cross-talk is fostered effectively, it leverages the best of all relevant areas of expertise to produce robust decision support tools. The result is better environmental choices that are more easily implemented and backed by scientifically sound methods. ESSA’s expertise in biophysical systems, decision analysis, geospatial analysis, and technical facilitation, combined with interdisciplinary training in environmental economics, situate us as an ideal bridging agent to provide economic services. 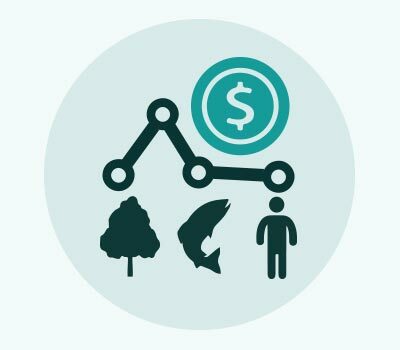 Whether incorporating the value of ecosystem services into economic decision support tools, evaluating the utility of different economic policy instruments, or developing a baseline with well-specified indicators, we ground economic assessment in rigorous, science-based approaches that will help you make good decisions your audience will support.